Pair cocktails and slices of house-made pie at this Brunswick bar. 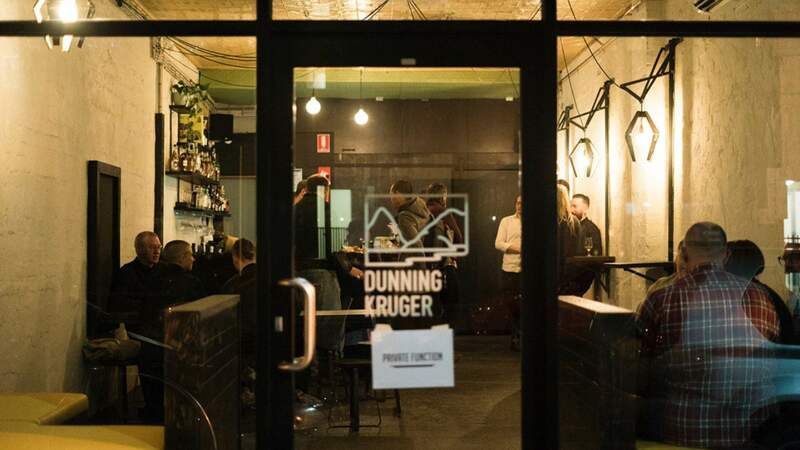 Lygon Street's top end has a new local hangout. It's hard to miss if you're strolling by as a distinct salutatory bellow from the barkeep drifts out the door to any and most passers-by. Gene Mills is one half of Dunning Kruger and the other is Courtney Tuul. Coming from solid hospitality beginnings (Tuul trained under Matt Forbes — the pastry chef behind venues such as Cobb Lane — and Mills hustled with the best of them at Beer DeLuxe and Proud Mary) the team has humble ideas about what they can achieve, but expertise that can only please. Salvaging the shell of an old fruit store, the space is now private-function savvy. There are nifty high tables and lights that rise and shine with them, as well as banquettes by the windows. But it's the day-to-evening happenings of vinyl and vegan pies that have us all a-tither. The bar's focus is novel: boilermakers and pie makers. The former we're familiar with, but it's the latter that no other bar in Melbourne has perfected so well. A pie and alcohol pairing ($19) of the house-made peach pie and a DePeach Mode cocktail (rye whiskey, peach liquor and orange bitters) was something we couldn't get enough of. Pie flavours change daily and there are vegan slices available, too — if you're that way inclined. The word on everyone's chips, however, is the Nacho Friend ($20) — an avocado and corn chip infused tequila with grilled citrus cordial and lime juice. Developed by the team's bartender extraordinaire Ash Johnson (formerly of Maha and Seamstress) the end result comes margarita-on-the-rocks style, garnished with a corn chip. But it's so much more than that. And you'd be remiss if you didn't partake. Rotating beers from Mornington are always on tap. We tried a schooner of Sorachi ($10) with a cheeseboard ($30) from Essendon monger Harper & Blohm – think Tasmanian cheddars, French triple creams and Irish blues – matching perfectly to the bar's canary yellow hues.